It’s difficult to put into words the sort of swelling of pride and overwhelming satisfaction we feel when we stroll these aisles. Every detail is something we dreamed about, decided was possible in actual reality (the zero-gravity space food aisle was a great concept but difficult to achieve), then sketched out and explained to contractors and carpenters, then built, and painted, and stocked. We literally built our dream market. And now we get to finally open the doors to you. We imagine you’ll stop in for cereal and milk on your way home and then, before you know it, you’ll find yourself with a basket full of our housemade sausages, and our freshly picked persimmons. Or you’ll grab a cup of Four Barrel coffee and one of Pinkies’ Bakeries’ delicious pastries and on your third sip you’ll be inspired to slip into the bulk aisle to make your own trail mix for the day. Maybe you’ll drop in with a friend to our wonderful deli, grab some freshly handmade sushi and sandwiches, and then head over to our neighbors at Humphrey Slocombe for the flavor they made just for us. If we’ve done things right (and we really think we have), you’ll plan your next grocery shopping trip around our store, filling your cart with locally sourced seafood, delightful sale items, our awesome selections of all your household staples at great prices, and house roasted meats from our deli. 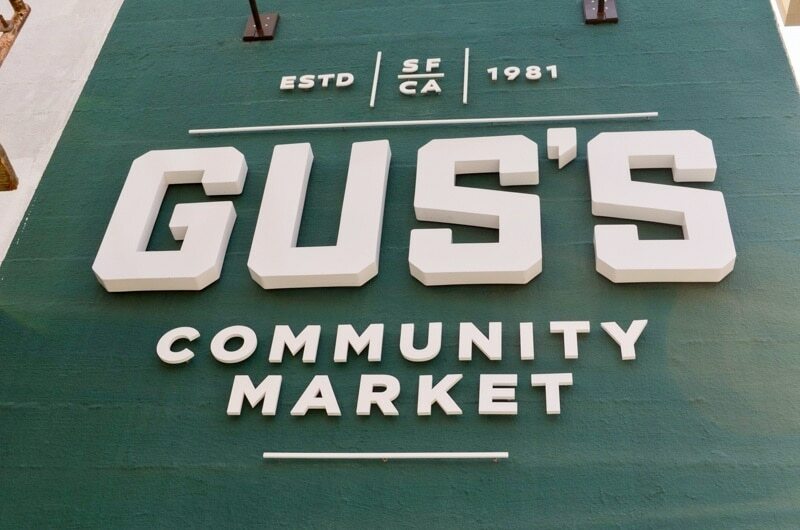 Gus’s isn’t our store, it’s yours. It’s a place that you can count on, a smorgasbord of good things to serve your family, your friends. We hand-selected our varieties of beers, ciders and spirits. We made sure our wine from around the world fit every price range. Heck, we even got something special brewed by our buddies at Magnolia, just for the store, flowing from one of the 8 taps we’ll always be happy to pull. Each department has been working as hard as they can to get Gus’s filled with as much goodness as possible. So welcome. Meet our great staff, sample our incredible wares, and join our family. We’re here now, for you.